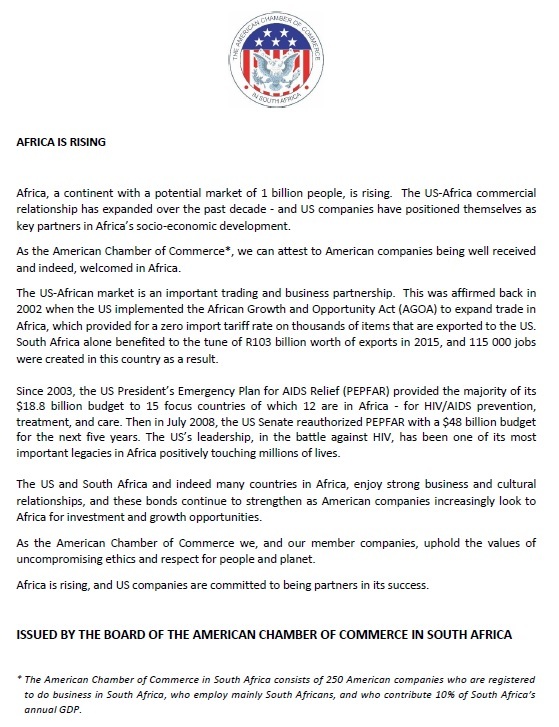 Welcome to the American Chamber of Commerce in South Africa (Amcham). The American Chamber of Commerce has been sustainably operating as a non-profit organisation in South Africa since 1977. We are the collective voice of U.S. investment in South Africa and through our elective board of directors and committees, we serve South African/American commerce and industry with our primary focus on U.S. investment in South Africa. As the American Chamber of Commerce we, and our member companies, uphold the values of uncompromising ethics and respect for people and planet. Below is a media statement released by our Board of Directors in January 2018. Africa is rising, and U.S. companies are committed to being partners in its success. Download our Business Climate Survey here. Click here to see our recently published Survey on Access to Medicines. Are you aware of cyber risks? View a handbook on cybersecurity and cyber risks. Our upcoming events can be accessed in our Events Calendar. We regret that events hosted by us are strictly for member companies and their representatives.